The Brinley Sectional is a limitless transitionally styled reclining sectional that is fit for those who love to have it their way. Choose to customize your sectional from 11 different pieces...choose from a large selection of Best Home Furnishings' stylish fabrics. Each piece is an individual seat allowing for an infinite number of configurations. It will be utilizing a patent pending bracketing system that prevents the seats from separating on the floor. The consoles come with the option of a soft close drawer for extra storage. 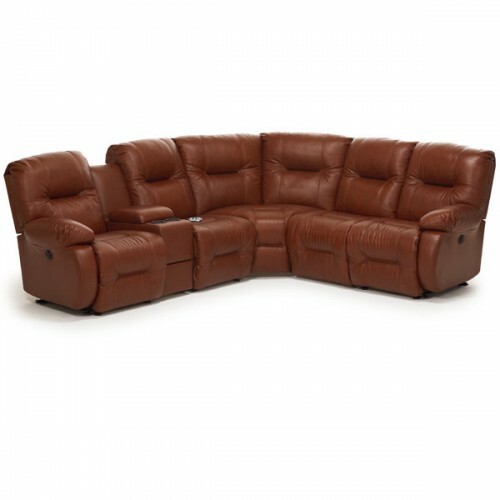 The recliner pieces are also available with the power recline option. Choose between fabric, geniune leather or Elements QC. Unit Weight (lbs) 30 Seat Width 22.75"
Unit Width 24" Arm Height N/A"
Unit Depth 40" Seat Height 20"